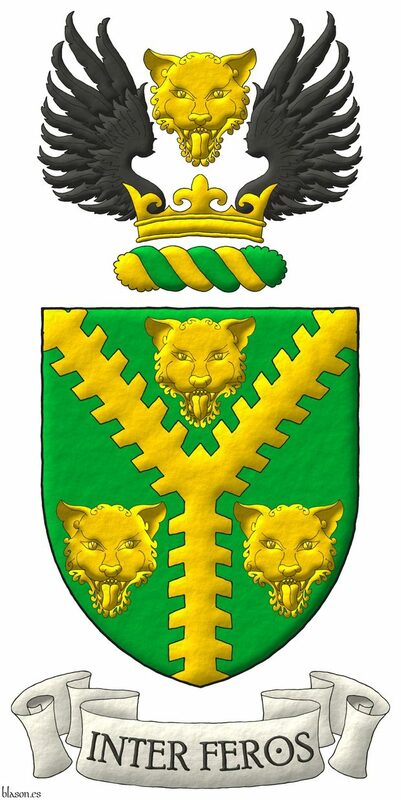 Blazon keywords: Vert, One, Pall, Raguly, Or, Three, Head, Leopard, Crest, Wreath, Upon, Crown, Between, Two, Wing, Sable and Motto (motivation). 0) «Palado de seis piezas de sinople y oro; brochante sobre el todo una banda de azur». 1) «Paly of six Azure and Or; over all a bend Azure». 2) «Paly of six Azure and Or; over all a bend Vert». 3) «Paly of six Vert and Or». 4) «Paly of six Vert and Or; over all a bend Vert». 5) «Paly of six Azure and Or». 6) «Paly of six Or and Azure; over all a bend Azure». 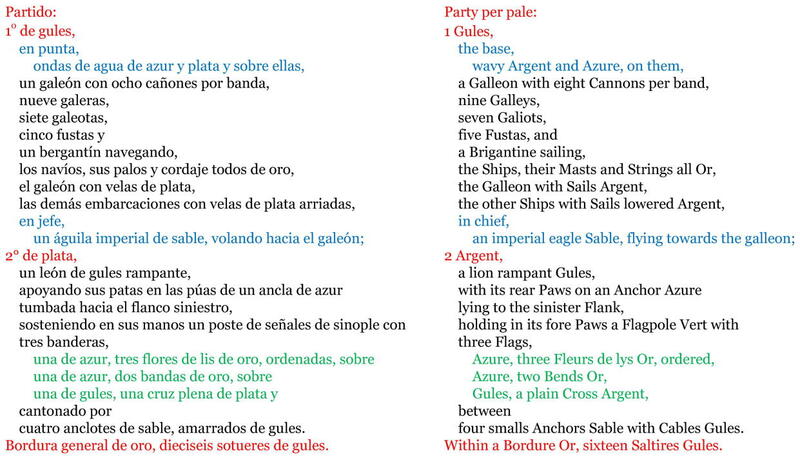 7) «Paly of six Vert and Or; over all a bend Azure». 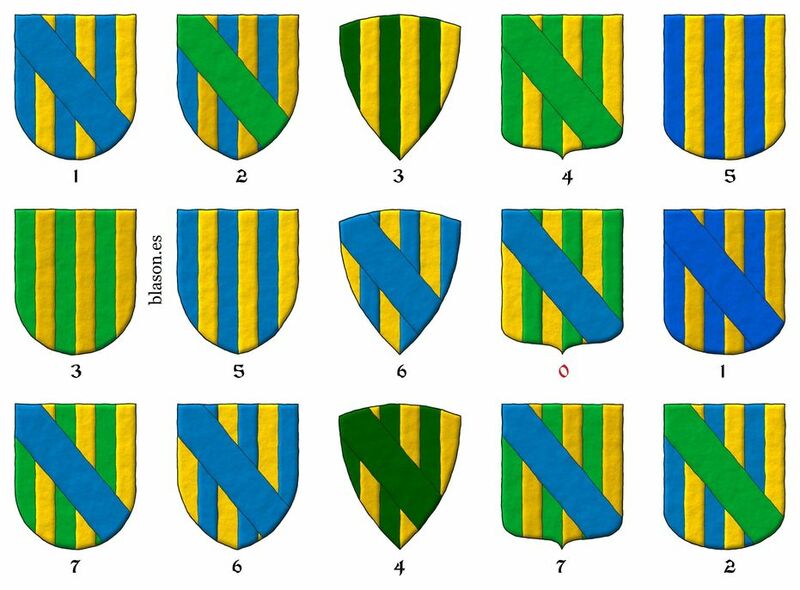 Categories: Riddle solution, Semi-circular, Pointed, Triangular curved, Pointed and rounded, Rounded, Outlined in sable, Freehand, Paly, Six, Surmounted, Over all, Bend, Azure, Vert and Or. Vicente de Cadenas y Vicent, Dean King of Arms, «Repertorio de blasones de la comunidad hispánica», Instituto Salazar Castro (C. S. I. C. Higher Center for Scientific Research), edited by Ediciones Hidalguía, printed by Gráficas Arias Montano, S. A., Móstoles, Volume IV, 2nd edition, 4454 pages numbered from 1525 to 1979, contains the surnames that begin with the letters S, T, U, V, W, X, Y and Z,, ISBN of the complete work 84-00-06642-1, ISBN of this Volume IV 84-00-06646-4, Legal Deposit M.31.950-1987, Madrid, 1987. This is my translation for the 4th coat of arms of the 5 blazons of surname «Uranzu» described on pages 1,726 and 1,728 of this book (see in the previous image of the original blazon). four smalls Anchors Sable with Cables Gules. Within a Bordure Or, sixteen Saltires Gules. 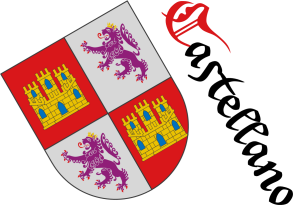 Although I am not sure of the reality of this coat of arms, I have made a) in Spanish a simplification and b) its translation in parallel to English. I assume that in the 2nd flag the Fleurs de lys in triangle are 3 and they are ordered. 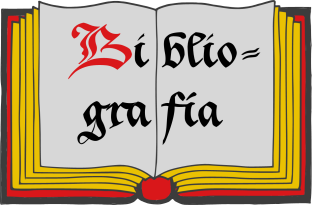 Although I am not sure of the reality of this busy coat of arms, I can't found a painted version, I have made a) a simplification of its Spanish blazon and b) its translation in parallel to English. I assume that in the 2nd flag the Fleurs de lys in triangle are 3 and they are ordered. 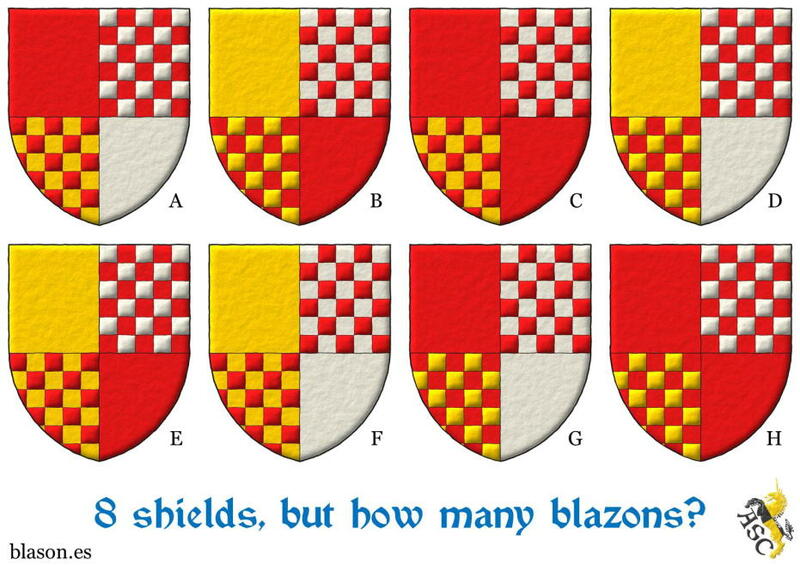 The colors of the text in the images lets an easy reading and show the blazon structure. There are in this coat of arms 1+9+7+5+1 = 23 ships. Currently the National Institute of Statistics of Spain (I. N. E.), about the surname «Uranzu» answer that «there are no inhabitants with the surname consulted», neither 1st nor 2nd surname, «or its frequency is less than 5 for the national total». Classification: Black and white with color plates. The classic heraldic layout for three charges on a coat of arms is two in chief and on in base. 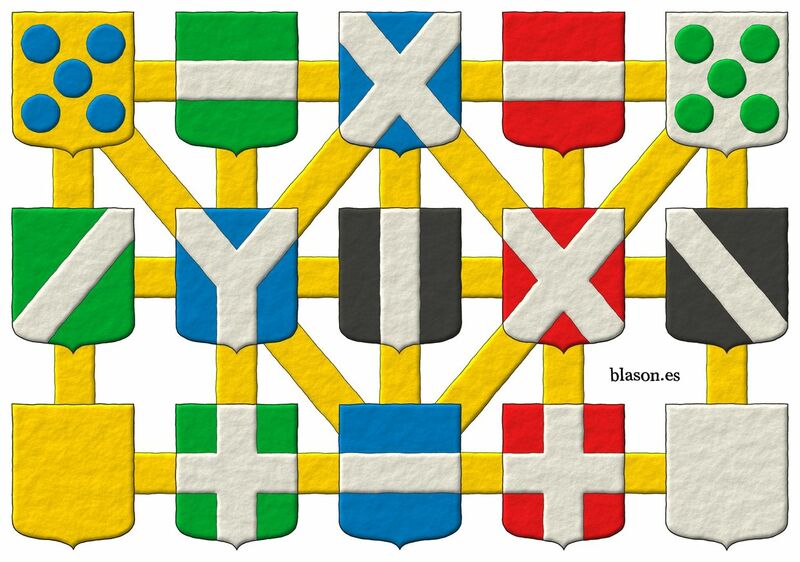 The layout one in chief and two at base are considered disordered in many heraldic traditions. The blazon of this coat of arms, «Sable, three Towers Or, two and one», is disordered, and the entropy refers to disorder, and more entropy means more disorder. Then this imaginary coat of arms is full of entropy, and it could belong to the entropy. Categories: Riddle solution, Imaginary, Sable, Three, Tower, Or, Two, One and Disordered. Sigue por: Pedigree collapse, we are all cousins. Pointed, Pointed and rounded, Azure, Bend, Bend sinister, Wreath, Head, Five, Crown, Cross, Cross, Quarterly, Four, Outlined in sable, Disordered, Two, Raguly, Black and white with color plates, In saltire, Coat of arms, Fess, Fleur de lis, Genealogy, Personal, Gifra, Vittorio, Gules, Illuminated, Imaginary, Interpreted, Motto (motivation), Leopard, Semi-circular, Wing, Or, Paly, Pale, Pall, Argent, Rounded, Hurt, torteau, pellet, pomme and golpe, Hurt, Pomme, Sable, Six, Vert, Riddle solution, Saltire, Freehand, Three and One.